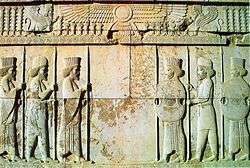 Media (Old Persian: Māda, Middle Persian: Mād) is a region of north-western Iran, best known for having been the political and cultural base of the Medes. 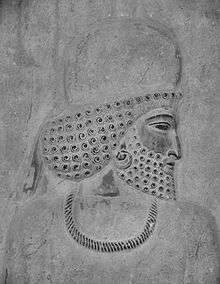 [N 1] During the Achaemenid period, it comprised present-day Azarbaijan, Iranian Kurdistan and western Tabaristan. 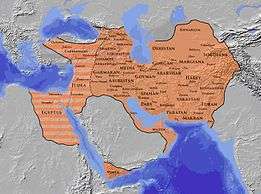 As a satrapy under Achaemenid rule, it would eventually encompass a wider region, stretching to southern Dagestan in the north. However, after the wars of Alexander the Great, the northern parts were separated and became known as Atropatene, while the remaining region became known as Lesser Media. The Medes spoke Median, a north-western Iranian language. ↑ Herodotus, The Histories, p. 93. 1 2 Meyer, Eduard (1911). "Media". In Chisholm, Hugh. Encyclopædia Britannica (11th ed.). Cambridge University Press. p. 21. ↑ Chaumont, M. L. Albania. Encyclopædia Iranica.